call it a spring festival. :: this post is for passed lunar spring festival. so many hopes fulfilled, while still so many uncertainty drives me restless. we thankful for God's mercy, and looking breaking through barriers more gracefully. I seemingly more and more see my future new family, my children to descend.this dawn I dreamed with my old family, my sister and brothers. I dreamt masturbated 4 times and anxious how to get rid of evidence. I dreamt of my cousins, ie sons of my only aunt. later dreamt my dad's eldest brother brought his grandson visited us. 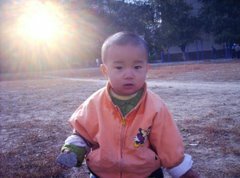 I help the infant find his billiard back but he almost risking putting in his mouth.today is 1st work day after Chinese greatest traditional holiday, but the dorm canteen still out of service for inadequate customers, operational irregularity or simply lazy. Chinese used spring festival to verify their family ties, threaten outer world out of service while their inner family enjoy harvest of rich food and banquet. this silly consciousness totally blind and even more dangerous in nowadays unified world under God's shine, seamless integrated civil society. I dislike the spring festival, more clearer since last Christmas day when my family business strides with triumph. now I missing a normal breakfast but unable to have. yesterday kid brother finally remit me 2nd part loan, ￥1500, which greatly relief my anxious upon debt caused by new domain zho.io, and recent shopping Walmart with son for glorious bliss. God, dad, thx for so many dangers extinguished on the way toward Royal China. bring me sooner my girls into our new family and budding lives. grant us monuments and momentums of growth and steadiness, save unease in our hearts, ie. my son's and mine. thx for the morning light, dad. dreamt of visiting American President. ::this lunar new year bring me a new gift, zhone's 18th domain, zho.io. I looking after .io for some time, but reckoned it too expensive, about $60 annually to buy. but good news of my kid brother's loan boosted my confidence. within 2 days I settled it under family sites. yesterday I spent half day expanded the nammespace to facebook, google, vimeo,linkedin, etc. its first domain I didn't originally concoct, but hinted by online media. zho stands for zhong language, Chinese, or China as central country, while .io means input and output. I literally looking forward it gathers conversations between Chinese and world languages forums, esp. English which so rich, powerful and meaningful, fruitful. this dawn I dreamt US President, Obama, visiting China. I was assigned handling a site for his visit. I arranged them, the president and his chief staff officer escorting, enjoyed among crowd a scenery pond. they had good time aside water but mud hopelessly stained their shoes. after they changed shoes, I managed the president autograph 8 or 10 books for holding before they left. then dreamt in a class in English exam. I can't bare lousy cheating murmurs and shift my seat to front row. my senior middle school alumnus, Wang Zaohui, and my once girl friend in Nanikai Univ, Liu Shuyun, among those mocking me during the test before monitoring teacher appears. their jeers led me irresolute. Its a pale morning of second day in lunar new year. I hope tomorrow I can fetch my son do monthly noble life experience, ie, cinema, Walmart, dine out, visiting my dorm. uncertainty is if those services resume then in the boring long traditional Chinese holiday. God, I need more 2-3000 RMB to stay debt free upon beginning lunar 2015. grant me embracing time ahead fearlessly. bring me sooner my Royal China to cultivate in time for agriculture. show my Crowned Queen, Asoh Yukiko, from Japan, road to me and our family preset. thx, dad God. dreamed of being intern of google. ::and finally I have my 3rd credit card, an ICBC multi-currency, mastercard jointly powered credit card. its swift for the issuer to deliver to me. when I bitingly waiting for it, I sometimes felt the tiny card shinier than my life so far wanting. even several day in my purse, I keep checking it every few hours to assure its in my blood, my financial life. soon after gained it, I equipped my son, woz's google play with it as payment method. it also powers woz's paypal, our localphone subscription auto-renewal. God, isn't it in good circumstance? hope I will never spoil trust in credit from the bank. in this dawn I dreamt worked in google, lengthily about its free meals. I also got insight upon its corporate operation and enterprise culture phenomena. so many promising quality I entrust it, google! smart automation, moral right, real intimate user experience, pivoting ambition & envision, etc. God, save google from mediocre by metabolism, like Brin who screwed up google glasses and far from cool personal lifestyle. upon my credit card deficit, ￥8000, my kid brother and sinful 2nd elder sister promised loaning me, but the sluggish brother broke his word timing several times. that quite frustrating, or what he intended to defy me? now I had to maintain the debt like a burden. God, dad, why my brother so acid in his claimed helping? what hurts him and let him dart like snake reward? isn't the losing strategy harnessed by China surveillance to crash my hopeful? to testify my gracious road under shrine? God, dad, in this soon to be shiny morning I pray, as so many answered falselessly, grant us debt barrier breaking, like yesterday's bonus ￥1300 from QRRS, my once and long time employer. grant me work space and sustainable energy to polish royal way toward my new 1109 years Empire of China in title Zhu. dad, God, empower us to see through Chinese spring festival and bond in Christian holiday. bring world peace and unity love and caring society. thx, dad.